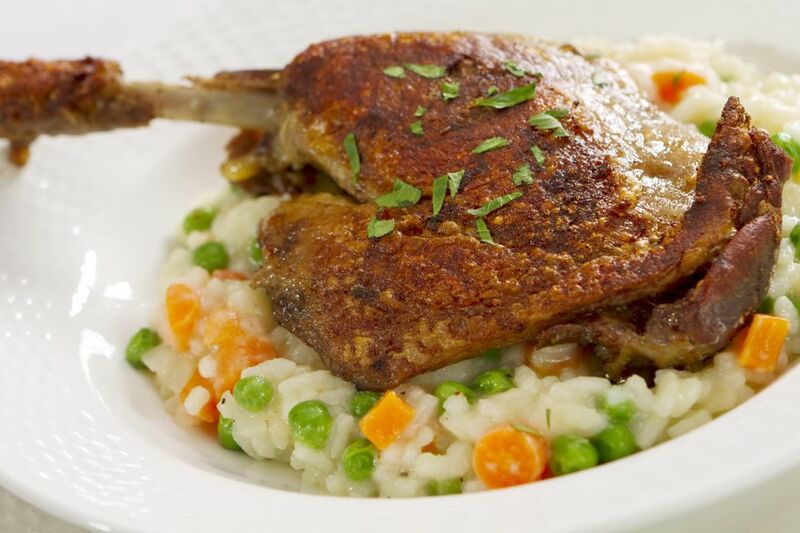 Duck confit is an essential ingredient in the classic cassoulet recipes of southwestern France. It is also fantastic on top of salads, combined with simple steamed potatoes, or served on toast. You can buy duck confit, but it's much less expensive and quite easy to make your own. The amounts given in the recipe are per pound of duck (about 1 large farm-raised duck leg). Multiply the amounts to accommodate the amount of duck you want to confit (yes, confit is a verb as well as a noun, at least to us cooks). Mix together the salt, sugar, thyme, black pepper, and nutmeg and curing salt (if using) in a large bowl or container. Add the duck pieces and rub the salt mixture all over them. Get into every cranny and over every surface. Cover and store in the refrigerator for 24 hours. Brush off as much of the salt and spices mixture as possible. Do not rinse it off - you want the duck as dry as possible for the next step. Place the duck skin-side down in a baking dish. Tuck 1 or 2 bay leaves under the duck. Spoon in 1 cup of the duck fat or pour the olive oil over the duck. If the fat or oil doesn't quite cover the duck, add more - you need the fat or oil to completely cover the meat for the confit-ing process to safely preserve it. Cook for 3 - 6 hours until the duck meat falls off the bone when you try to lift out a leg or other piece. Separate the meat from the bones. Loosely pack the duck meat into heatproof glass or other non-plastic food storage containers. Cover with the still-warm duck fat and/or oil. Run a butter knife or spoon down the sides of the container to release any air bubbles. Once you are sure that the duck meat is completely covered on all surfaces by the fat or oil, cover the jar tightly and store it in the refrigerator. Duck confit will keep in the refrigerator for 3 months. For longer storage, you can freeze it for up to 1 year. Note: the fat/oil will congeal into a semi-solid when it is cold, but will return to a liquid state when warmed.